Democrat Scott Peters served locally on the City Council from 2000 to 2008. He became the city council’s first president in 2004, when a new form of mayoral structure allowed him to serve as the chief officer of the city’s new legislative branch. Peters ran for the 52 Congressional District in 2012 and defeated incumbent Republican Brian Bilbray by 6,956 votes. He assumed office as a member of the U.S. House of Representatives on Jan. 3, 2013. Peters calls himself a “product of financial aid” who knows the difficulties of paying for an education. “I knew that if I studied hard and got the grades to go to college that my parents could pay for it because we had grants, we had low interest loans and I got a work study job,” Peters said. Peters is currently working on legislation that would keep all federal loans below four percent. “If we’re charging six (or) eight percent, the federal government is making money on those loans and we’re telling students, ‘we want you to pay for the federal deficit,’ which is the wrong thing to do,” Peters said. Another way Peters hopes to help students with debt is through a bill that will incentivize employers to pay back their employees’ student loans and give a tax benefit to the company. Peters stresses the importance of getting an education because that was how he built his career. “We can’t exactly compete in a brain-powered economy if we’re not powering our brains,” he said. Peters wants to make education a priority in the federal budget, which he pegs as a main difference between him and his opponent, Republican Carl DeMaio. Peters’ record also shows that sustainability and climate action have a place in his campaign. If is re-elected to Congress, he plans to make climate action a priority. Peters has a few bills designed to propel sustainability forward. One of the bills tries to prepare communities for extreme weather, which he said is a result of climate change. He is also working closely with the military to invest in biofuels and other alternative energies. “If we can just do small investments in alternative energy in the military, they could have a huge impact in San Diego,” Peters said. 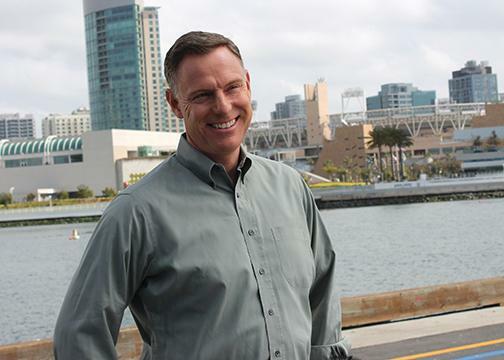 He supports Mayor Kevin Faulconer’s Climate Action Plan that puts San Diego on track to reduce greenhouse emissions and addresses other city sustainability issues. When it comes to eduction, Peters’ wants to impact students directly by helping ease the process of paying back loans. Because he went through the experience of having to take on student loans, he says that he realizes how important it was for his success. He also hopes to revitalize the economy and make sure that there are jobs when students graduate, which he said is affected by a combination of tax reform, immigration reform, and investing in infrastructure. Peters wants to make basic investments in science a budget priority in San Diego. “I’m big on investing in jobs of the future, specifically biotechnology has been a priority of mine,” he said. Peters advised young voters to voice their thoughts on issues that are important to them. See the profile on opposing candidate Carl DeMaio here.